Please find a list of resources for Trustees including: WLTF, United for Libraries, Trustee Essentials and more. For specific agreements, please contact WVLS Director Marla Sepnafski at 715-261-7250 or by email at msepanfski@wvls.org. Includes blog posts, website updates, news releases, and member library spotlights as appropriate. WVLS maintains email lists for library staff working in youth services, technology, V-Cat representatives and more. Send an email to help@librarieswin.org to have your email added to appropriate lists. This handbook will provide you with some of the essential information that you need to succeed in your position as a public library director in Wisconsin. A division of the Wisconsin Library Association. WLTF membership offers and opportunity to learn more about state library trends and services through publications from WLA, attendance at workshops and conferences, and a means of interaction with other trustees, advocates, and friends. A division of the American Library Association. United for Libraries will continue to build on the work and success of both ALTA and FOLUSA by helping Trustees and Friends work together at the local, state, and national levels to effectively promote and advocate for libraries, encouraging the development of library Foundations, and engaging corporate supporters to unite and strengthen voices in support of libraries. The mission of United for Libraries is to support those who govern, promote, advocate, and fundraise for all types of libraries. The Trustee Zone and United for Libraries provides training in webinars and guides for trustees. Short Takes for Trustees is a series of 10 short videos (8-10 minutes) that can be shown during trustee meetings to stimulate discussion about the important role that trustees play in the governance of their libraries. Subscription required. Trustee Academy is a series of online courses to help trustees become proficient in their roles on behalf of their library. Requires registration. The Librarian’s Report is a summary of WVLS staff members’ activities for the period of January-December 2016. This report is to be considered in the context of the 2016 System Plan, i.e., staff members are reporting on their progress in meeting their assigned responsibilities within the annual plan. Prepared by the Division for Libraries and Technology with the assistance of the Wisconsin Public Library Trustee Handbook Revision Task Force, Trustee Essentials: A Handbook for Wisconsin Public Library Trustees outlines the “exciting, challenging, and rewarding” duties of Library Trustees and provides basic information needed to serve a library community. So you’re a trustee! How did that happen, and what is expected of you now? Who is responsible for developing and approving library policies? How do you develop good (and legal) policies? 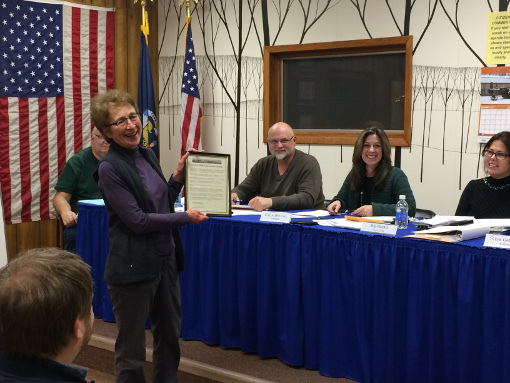 The Demmer Memorial Library and City of Three Lakes presented Library Trustee Vicki Reuling with the Three Lakes Service Award in recognition for her service on the library board. Photo courtesy of Director Erica Brewster.